This file photo taken on 21 April, 2017 shows an aerial view of a reef near the island of Thitu, with what are believed to be anchored Chinese boats, in the disputed Spratly islands. 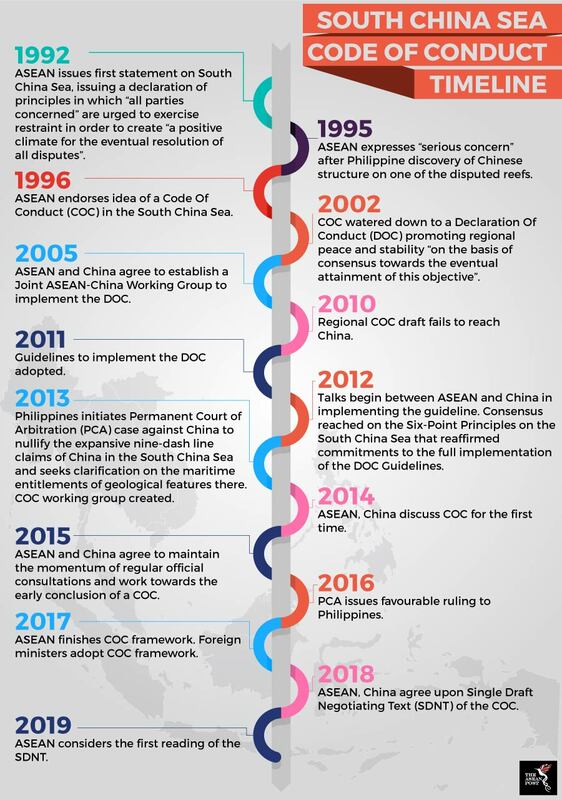 The South China Sea’s Code Of Conduct (COC) will likely be on the agenda at this week’s ASEAN Foreign Ministers’ Retreat, but analysts do not expect any major breakthroughs to be reached in Chiang Mai. The northern Thai city is the venue for the 17-18 January meeting which marks the first time Thailand plays host as the new chair for the 10-member bloc this year. Busadee Santipitaks, the Director-General of the Department of Information and Spokesperson for the Thai Ministry of Foreign Affairs, said that the meeting will set the tone, agenda and views that Thailand hope to push as part of its Chairmanship theme of ‘Advancing Partnership for Sustainability’. The Rohingya crisis and implications of the ongoing United States (US)-China trade war on ASEAN are expected to be some of the more urgent issues on the agenda, and although the Regional Comprehensive Economic Partnership (RCEP) and the Indo-Pacific Strategy initiated by the US will also take up the diplomats’ time, COC discussions will also be on the table. The COC between Beijing – which claims the South China Sea almost in its entirety – and ASEAN is meant to govern behaviour in the strategic global shipping zone rich in resources. Although the Declaration on the Conduct (DOC) of Parties in the South China Sea was created in 2002, the declaration is non-binding. 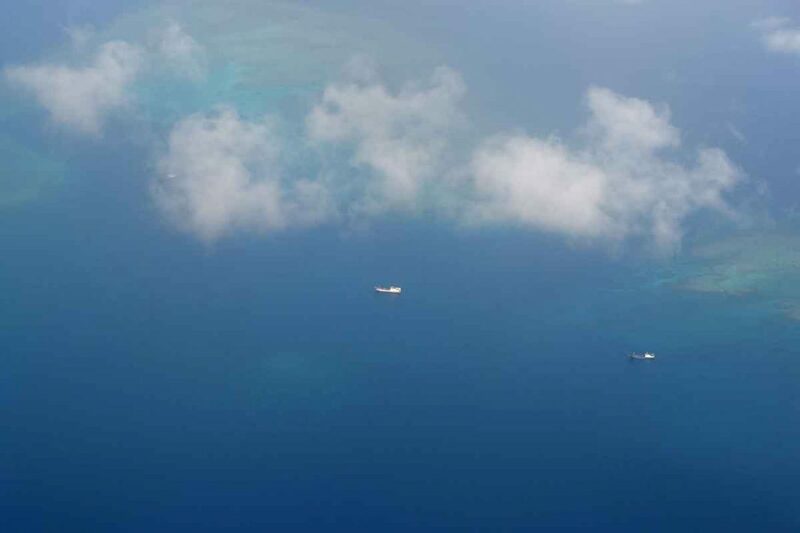 Vietnam, Malaysia, Indonesia and the Philippines are disputing territories in the South China Sea with China. Suriya Chiadawongse, Director General of the ASEAN Affairs Department under Thailand’s Ministry of Foreign Affairs, said that ASEAN is now considering the first reading of the code’s Single Draft Negotiating Text (SDNT) that China and ASEAN agreed on last August. With Thailand intending to finish the first reading of the text by this year, the retreat seems like an ideal avenue to continue COC discussions which first started in 2014. In an interview with The ASEAN Post, Thomas Daniel, a Foreign Policy and Security Studies Analyst at Malaysia’s Institute of Strategic and International Studies (ISIS), said that the COC will definitely be discussed this week but it will take a while to finalise – noting that the Single Draft Negotiating Text was only agreed upon in August last year. “Negotiations for the COC will only progress as fast as China wants it to,” Daniel pointed out. “The DOC was supposed to be a pre-amble to the COC, but there was a delay of more than a decade until negotiations started for the COC – and no one really followed the DOC in spirit,” he added. According to Daniel, the discussion now is on where the COC is going since there are several contentious issues like the role of external stakeholders – and rights of the parties to cooperate with them – that the negotiating parties are stuck on. “We’re now down to the meat of the issue – and that’s where the real differences are,” said Daniel. “If the claimants want the COC to be something tangible and implemented, it would affect all the claimants differently. Would they all follow it? “There are two possibilities here. It is unlikely that most of the negotiating parties will want to sign a COC that is water-tight and legally binding. In order for a COC that will be palatable to all parties, we could end up with a final text that is sufficiently vague and doesn’t have all that much substance,” he explained. During last year’s ASEAN Summit in Singapore, Chinese Premier Li Keqiang said he hoped the COC negotiations will be concluded by 2021. Although he does not think COC discussions are a priority in Chiang Mai, Dr. Termsak Chalermpalanupap, Fellow and Lead Political & Security Affairs Researcher at the ASEAN Studies Centre, said negotiations are on the right track. “So far so good,” he told The ASEAN Post when asked about the status of COC negotiations. “Nothing too exciting and nothing to worry about now that the goal has been set – to have the COC in three years. “Whether there will be ratification or not depends on the nature and the status of the COC. If it turns out to be a legally binding international agreement – which I doubt it will be! — then ratification is needed. “In that case, it may take quite some time to have all the 11 ratifications (10 in ASEAN and 1 in China),” added Dr. Termsak, a former Director of Political and Security Cooperation at the ASEAN Secretariat in Jakarta. Apart from the ASEAN Coordinating Centre for Humanitarian Assistance on Disaster Management’s (AHA Centre) preparation to do a needs assessment in Rakhine, Dr Termsak also expects the retreat to see Thailand explain its big idea of “connect the connectivity” and how to guide infrastructure connectivity frameworks, such as China’s Belt and Road Initiative (BRI) and the Master Plan on ASEAN Connectivity, in a direction that will benefit all ASEAN members. This article by Jason Thomas and was first published in The ASEAN Post on 15 January 2019. Can ASEAN be counted on when it matters? ISIS Malaysia engages actively in Track Two diplomacy, and promotes the exchange of views and opinions at both the national and international levels. © Copyright 2018. ISIS Malaysia. All rights reserved.